The Playbase is a nice option for people wanting a unified, Apple-connected home theater experience, even if it doesn't offer anything radically different from Sonos' older home theater accessory, the Playbar. We recently reviewed the Playbar, as well as a whole-home Sonos setup. While the Playbase is a new product, much of what we said in those pieces still applies here. To recap the similarities: after plugging things in, setup and control is handled almost entirely through the Sonos Controller app, available for devices like iPhones and iPads. Buyers are expected to connect the speaker to Wi-Fi and a Sonos account, then optionally pair it with an IR remote, and/or run "Trueplay" tuning. The latter involves walking around a room waving a mobile device -- in our case, an iPhone -- to pick up loud pulsing sounds. This feels a little silly and runs the risk of annoying family and neighbors, but as with the Playbar, it did result in good sound during our tests. To play music, owners can point the Controller app to files on their mobile device, to a connected Mac or Windows PC, or else over 30 streaming services such as Apple Music, Spotify, Pandora, TuneIn, and Google Play Music. In fact Controller is the only way of handling music on the Playbase, at least if it isn't routed through a TV. Options unique to each service typically stay intact -- with Pandora, for example, listeners can vote tracks up or down. It's easy to switch between different audio sources, and people with multiple Sonos speakers can quickly group or de-group them, adjusting volume separately or in tandem. While watching TV, Playbase owners have additional "Night Sound" and "Speech Enhancement" options designed for low-volume listening. Where the Playbase sets itself apart is in form factor. Thanks to some clever design it's actually built to sit underneath TVs, rather than in front, up to a maximum weight of 77 pounds. Alternately it can rest on a shelf -- so long as there's plenty of space, naturally. Regardless of where you put it the Playbase is pretty stylish, with clean lines, and black and white options to match different room aesthetics. Buttons are minimal, and cables are kept out of sight. We did find it a little cumbersome to install, though. Many people will somehow have to lift their TV and slip the Playbase underneath, which can often be a two- or three-person operation, especially with older, heavier TVs. On top of that, the way the cable jacks are recessed can make them hard to reach if a TV is right next to a corner or wall. One problem some people may have already guessed: what happens if a TV uses split stands, instead of a single post? The speaker should slip in between as long as the stands are at least 2.3 inches tall, but there's still the risk the stands will be too close together. Any remaining issues are the same we encountered with the Playbar. There's no Siri control to speak of, and there are no connections for Bluetooth, HDMI, or 3.5-millimeter stereo -- inputs are limited to optical, Ethernet, and Wi-Fi, effectively locking owners into the Sonos ecosystem. In terms of audio quality thankfully the Playbase is fantastic, delivering clean sound across mids, lows, and highs, along with plenty of bass. Indeed it manages more bass than the Playbar, enough that we were able to feel it in an office chair a dozen feet away -- at quarter volume no less. Some people may still insist on buying a Sonos Sub, but for most, that's probably unnecessary. Because it can play music from so many digital sources, the Playbase can be a handy all-in-one solution for living room audio. It should work as great with Apple Music as it does with movies and TV shows. Our only reservations are that the Playbase may literally not fit into some setups, and once again, there's the issue of platform lock-in. The speaker sounds great and Controller is (normally) very convenient, but owners are completely out of luck if they want to use different apps, or even mix in third-party speakers. 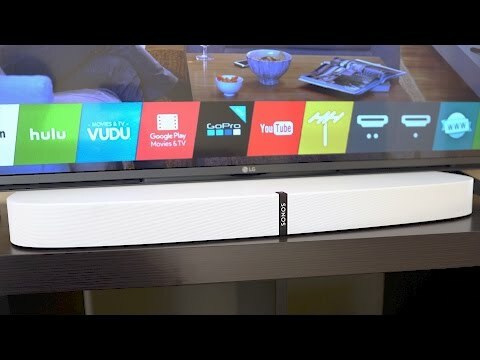 It's possible to upgrade to 5.1-channel surround sound, but only in a very expensive setup linking other Sonos products. If none of these present serious obstacles, then by all means -- dive right in. The Sonos Playbase is available today at B&H for $699.00 with free shipping and no sales tax on orders shipped outside NY and NJ. Third-party Amazon seller OneCall also has the Playbase in stock for $699.00 with free shipping and no interest if paid in full within 12 months using the Amazon.com Store Card. Prefer to buy direct? Sonos is offering shoppers free 2-day shipping with promo code FRE2NDYSHP17 and a 45-day return window. Welcome to Sonosinsider. Seriously. Quit placing sponsored reviews/advertisements. I couldn't in good conscience pay this much for a living room speaker without a HDMI connection. Therefore there's no way it'd get a 4/5 in my world. Or maybe the author loves the product and doesn't want to see the company go down. with layoffs last year and the long time CEO John MacFarlane leaving the company. going the AirPort Express route with them. I'm wondering what the Apple speaker will do? Hopefully we will get an announcement /preview at WWDC. Count me with the Sonos admirers. You make make a good point about Sonos + Podcasts. This is more of an issue than it not accepting the wire of choice of some nerds. In my dreams, Overcast partners with them and becomes an integrated service. In the meantime, my hack is to feed the podcast into the Sonos system from my iPhone via AirPlay to the PlayBar which distributes it to the rest of the system. Super annoying, but it works. Get the Playbase if have no intention of buying a Sonos Sub and no desire to wall-mount. The soundbar had age to excuse the lack of hdmi-arc, this is brand new, no excuses this time.